Operation Finale is a drama/thriller which features Mossad agent Peter Malkin and the Nazi Offcier Adolf Eichmann. Once more Oscar Isaac will play a great role in the movie as agent Peter Malkin. This tells about the story of how the Mossad, Israel’s Intelligence authority, hunt down and finally captured the Nazi Eichamnn (the man behind the for mapping out he “Final Solution which bring the Nazis to execute a terrible plan to execute millions of people especially the Jewish people in the prison camps). There are many important decisions the agent (Peter) of the Israel must do even beyond the line of his work in order to get Eichmann who have been hiding in Argentina for many years. Peter Malkin’s idea is not just to stop the Nazi but to end the life of Nazi war criminal in his hand before he can bring the Nazi to the court for trial. Isaac and Kingsley shows great tandem in the movie along with other popular celebrities that pull off great acting to give life to the movie. After a successful marketing strategy, the movie is now ready to hit theaters this month. 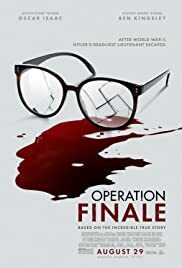 So are you excited to see what is the movie’s conclusion, then be sure not miss Operation Finale and prepare yourself to experience a very intense and suspense docudrama.